It was a great pleasure to work with Fr. Frank Purcell recently, who’s vision was to bring a new website with fresh, modern feel and look to the people of St John’s Parish, Kilkenny. Having worked closely with Fr Frank over a few weeks we designed and developed a website that is easy to navigate with the information his parishioners want, just a click away. Such as upcoming events, notices, death notices and contact details for parish groups and community groups. Caring for the community is Fr Frank’s real passion, helping him do it, with an easy-to-use, easy-to-update website was ours at Parish Websites. 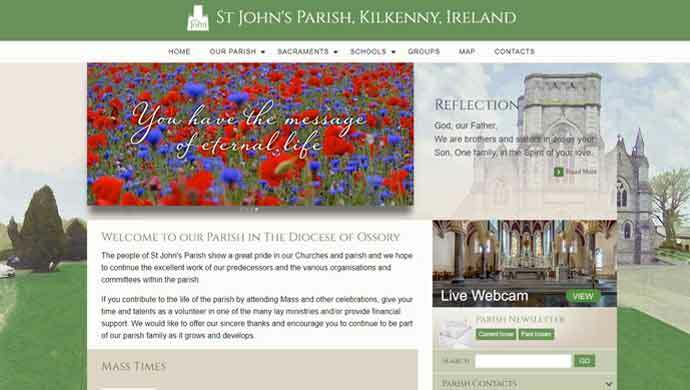 St John’s Parish also have live streaming which is invaluable for elderly people who are unable to attend services, those who are housebound due to illness or disability or those who are abroad and cannot attend a loved ones funeral or wedding. St John’s Parish website is optimised for mobile and tablet, so keeping in touch with the whole community even when they are on the go!